We believe in supporting positive mental health as well as promoting exercise and meditation. Your mindset is so important for doing more than you think you can do. 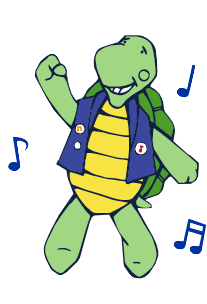 At Turtle Dance Music and AutismFriendlyShows.com we want to model positive behaviors so that the kids can copy us at home. I had a terrible headache this morning. I sat in my car and listened to the meditation below. There was a pain radiating in right side of my head. After listening to the meditation the pain decreased. Now, I also took some ibuprofen which totally helped (although it may be a placebo but that’s okay. Whatever works works!). I have been meditating on a regular basis for the last two years and it has definitely helped me with some of the anxieties around having a new child. Teddy, my son, is now almost 8 months old and sometimes I meditate and focus on my breath while rocking him to sleep. It absolutely helps calm him down as well as calming myself down. Even if it is a placebo it is very effective. However, I doubt that meditation is a placebo because you are focusing on your breath instead of what is currently stressing you out. It’s very simple and it just works. I love a song like Jens Lekman’s If I Could Cry because it reminds me of my wedding to my wife. I love listening to music and working out because it helps me blow off steam, clear my mind and focus on the things that make me feel positive in my own life. I love focusing on the things that make me feel positive like my wife, my son and my dog. My wife and son also came to my last performance of the day. What a treat! I feel so special that I get to be a father. I want to make sure that I am performing my best for my family and for the wonderful audiences who attend our performances. We want to promote mental wellness, physical health and meditation and we have to practice what we preach in our own lives.